On the Beach had been on my bookshelf for years, and I had always looked forward to reading it since the author, Nevil Shute, also penned the novel one of my favorite Jimmy Stewart movies (No Highway in the Sky) was based on. On the Beach was an entirely different experience. On the one hand, it is possibly the most interesting take on the end of the world I've ever read. On the other hand, I kept finding myself questioning the authenticity of the characters' actions and outlooks. The 1957 novel was written in the early Cold War-era and explores the outcome of mutually assured self-destruction from a profoundly interesting vantage point: Australia. 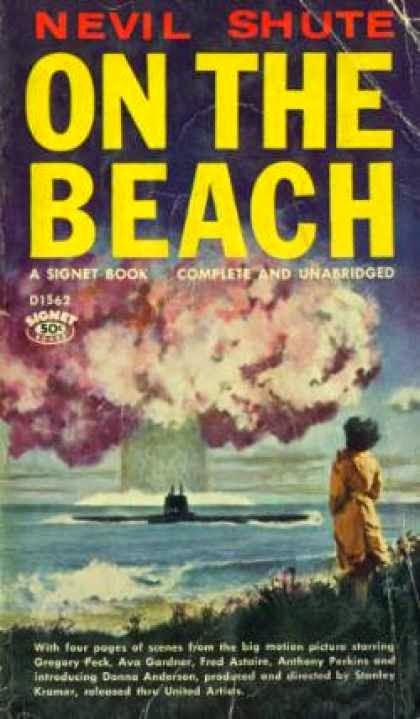 Two years after a nuclear holocaust between Russia, China, the United States, and other, smaller and less-accountable nuclear powers wiped out all of humanity in the Northern Hemisphere in six days, this book begins as the southernmost inhabitants of the planet wait for the global winds to bring the lethal radiation to them. Everyone will die. There is no escape. This is the end of humanity, and there's nothing to do but wait for it. To quote T.S. Eliot, as Shute does, "This is the way the world ends / This is the way the world ends / This is the way the world ends / Not with a bang, but a whimper." The novel follows Lieutenant Peter Holmes, a newlywed and new father in the Australian Navy, as he is assigned to one of the only two remaining American naval vessels, a submarine that was submerged when the war happened, and surfaced to find it had nowhere to go but Australia. It's no spoiler to say we then read about Peter, his family, and his friends, both on the submarine and on the mainland, living out their – and all of humanity's – last days on Earth. The characters are well-drawn and each is endearingly noble. It's sad to see them go. But the thing that irked me about the novel was how normally everyone acted. There was no looting, no particular lawlessness, and only a couple of people who were even habitually drinking too much. Believe me, if somebody told Americans there were only six months left for all of us, we'd be beyond Thunderdome in no time. Maybe it's the British stuff-upper-lip-and-all-that influence, but almost everyone in the novel just goes about their business, making plans for next year, and generally acting as though the world were normal. I get it, it's a coping mechanism, but I never believed everybody would use the same one. That said, this novel really got under my skin, so much so that I dreamed one night that I was in the same spot the characters were in, having a goodbye party at my office to say "we'll meet again" to all my coworkers, and all we'd ever known, and life on this planet. It is an unrelentingly bleak book, like the movie Fail-Safe, but a nevertheless moving testament to the bullet we all collectively dodged, and should hope to never encounter again, and all that should be lost if we are not so lucky.